Pomelo, a common Thai citrus, is becoming more popular in the US. I don't remember seeing pomelos at all the markets like I do now. The majority of Thai pomelos have light, yellow flesh, some with a tint of pink, not pink like the variety available in the US. Thai pomelos are also sweeter and less bitter. 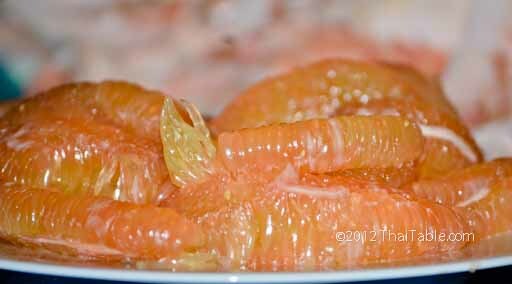 It's common to serve a plate of pomelo after a meal in place of dessert. 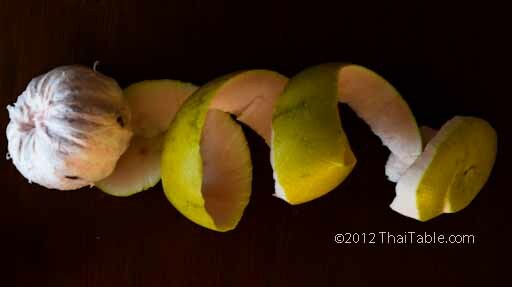 One of the things I remember that fascinated me about adults is their ability to peel a pomelo. My aunt would peel the thick skin off by going around with a knife while keeping the peel in one piece. Then she would peel the white fluff away from the fruit. She’d separate each section like you would with an orange. Each section's outer skin gets peeled off again, leaving with just the large plump pulp still attached like a section of an orange. We eat pomelos as fruit and also add them to salad. The peel the would usually go on my head while I paraded around the house with my new hat! Picking Pomelos: pick ones that seem heavy for the size. The skin should be smooth. The bottom should be flat or have a dimple. Ones that have bottom sticking out are not ready/ripe. 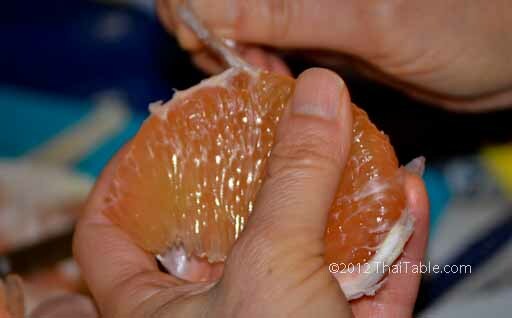 Remove the thick rind by cutting away all around the fruit. Continute to peel away the soft white part until you get to the fruit. You'll see the sections. Cut in the center from top to bottom, not cross sectional. Peel each section out like you'd with orange. With a knife, cut the thick membrane open like when you use the letter opener to open an envelope. Gently peel the membrane off.